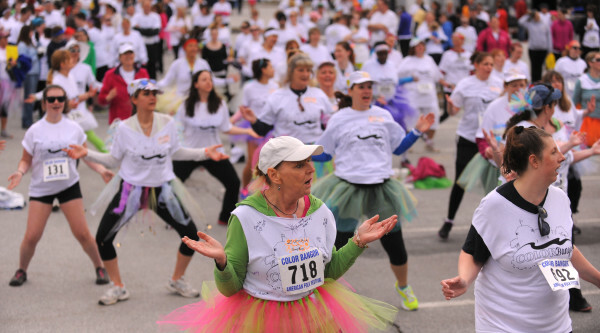 People warm up before the start of the Color Bangor 5K run in April 2014 to raise money for the American Folk Festival. About 1700 runners and walkers completed the 5 kilometer race while being pelted with dyed starch along the way. Monty Rand was well colored by his friends before the start of the Color Bangor 5K run to raise money for the American Folk Festival. About 1700 runners and walkers completed the 5 kilometer race while being pelted with died starch along the way. People pose for a photo before the start of the Color Bangor 5K run in April 2014 to raise money for American Folk Festival on Saturday. About 1700 runners and walkers completed the 5 kilometer race while being pelted with dyed starch along the way. 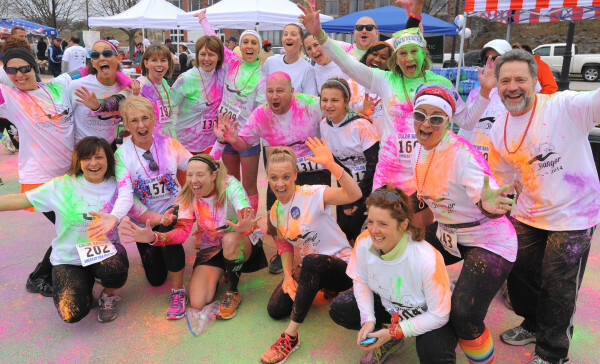 BANGOR, Maine — The American Folk Festival has announced its second annual color fun run/walk to take place in Bangor, sponsored by Changing Seasons Federal Credit Union. The event will be held on Sunday, May 17, and will incorporate color, running and walking, and high energy. 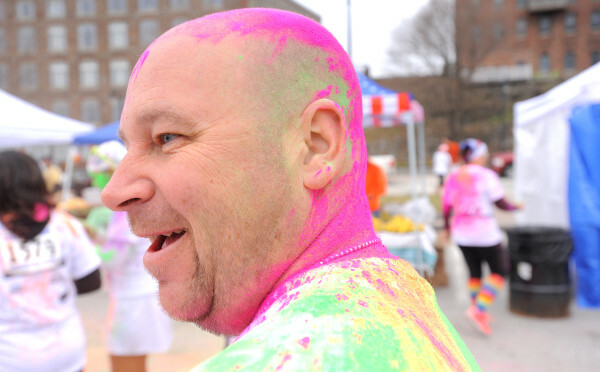 The run will be similar to last year’s inaugural Color Bangor fun run, and other color-themed runs that have taken place throughout Maine and around the country. Color Bangor will again use a route that incorporates the Bangor Waterfront. starch, FDA approved and perfectly healthy to use in this manner. heard from so many people last year who watched from the sidelines and were already looking forward to doing it in 2015. It’s not a serious race. The main objective is to have fun, and we will do everything we can to make that happen. Registration for Color Bangor opens at noon Monday, Feb. 9, at americanfolkfestival.com or by calling the American Folk Festival office at 992-2630. Early registration pricing runs through March 16 and is $35 for individuals 13 and older, $33 per person for teams of eight or more, and $25 for children. Pricing will increase on March 17. Updates and giveaways will be done through the American Folk Festival Facebook page. Sponsorship opportunities are also available. Color Bangor will raise money for the American Folk Festival, which takes place every August on the Bangor Waterfront. For more information on Color Bangor or the American Folk Festival, visit www.americanfolkfestival.com. The American Folk Festival has been a premiere attraction on the Bangor Waterfront since 2002. During the last 13 years, the festival has grown to include a multitude of cultural acts, crafts, and foods from across the world for one weekend in August on the Bangor Waterfront. Entrance to the festival is free, but a suggested donation of $10 per day per person is encouraged to ensure the festival is able to continue to bring the wealth of culture and tradition to Bangor.